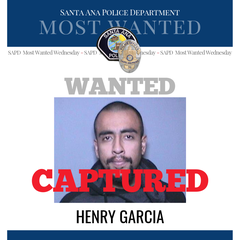 Wanted suspect Garcia is now in custody thanks to the assistance of our community and our partners at Anaheim Police Department who made the arrest. On 7/2/18, at approximately 11:50 pm, the victim was collecting cardboard boxes from behind the AutoZone. The victim’s vehicle was parked in the loading dock of the AutoZone, while his blind wife was sitting in the front passenger seat. Three male suspects approached the victim. The victim was pushed to the ground and assaulted by one suspect, while the other two suspects entered his vehicle. Garcia entered the driver’s seat of the victim’s vehicle while the other two suspects got into the back seat. The suspects fled the scene in the vehicle with the blind victim still seated in the front passenger seat. SAPD officers located the vehicle several miles away. All three suspects fled from officers and only one of the suspects was apprehended. The blind victim remained in the vehicle and was found by Officers to be ok. SAPD detectives recently obtained a DNA hit on the evidence left in the vehicle by Garcia. Garcia was positively identified as the driver by the victim.